The MySQL Database Server is the leading open-source database offering and is the most popular database to use with PHP applications. MySQL AB boasts 11 million installations of the MySQL database, which is used in both large and small organizations. While the MySQL Database Server can be used independently of PHP, a large number of implementations of the MySQL Database Server on the IBM® System i™ platform are likely to be directly associated with PHP. PHP is a widely-used general-purpose scripting language that is especially suited for Web development. Typically, PHP is embedded inside of HTML and provides the business logic for enabling data access and manipulation from within HTML Web pages. Often the MySQL Database Server is the data repository that PHP applications will access and manipulate. The MySQL Database Server, especially when coupled with PHP, is well suited for the development and deployment of Web-based applications. In fact, the Web arena is seeing a steady shift away from customized development toward the deployment of Web applications by content owners who use open community applications to deploy their content with their own design and usage capabilities. Support for the MySQL Database Server on IBM i5/OS® facilitates the deployment of such applications on the System i platform. 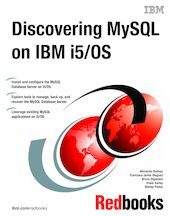 In this IBM Redbooks® publication, we explain how you can install, configure, tailor, and manage the MySQL Database Server on i5/OS. We also help to broaden your understanding of its architecture on i5/OS. In addition, we illustrate open community applications that can be installed and run on IBM i5/OS.